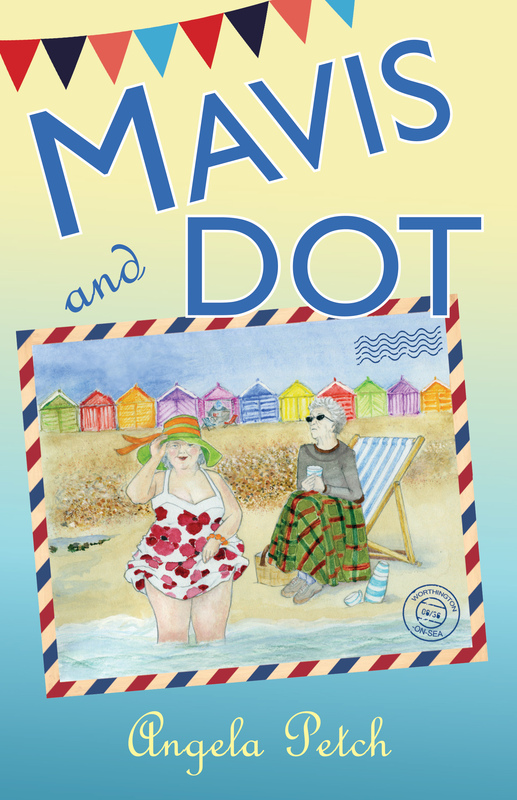 I am delighted to welcome Angela Petch and her charming, amusing, wonderful story of Mavis and Dot. You will get to know these two ladies, as we have a special excerpt and my review for you. Look for the Author’s Bio and of course the buy links! Mavis and Dot would make a lovely gift for your friends and family, and even yourself! A gently humorous, often side-splitting, heart-warming snapshot of two memorable characters with past secrets and passions. Escape for a couple of hours into this snapshot of a faded, British seaside town. You’ll laugh and cry but probably laugh more.” This book is quirky and individual, and has great pathos…[it] will resonate with a lot of readers.” Gill Kaye – Editor of Ingenu(e). 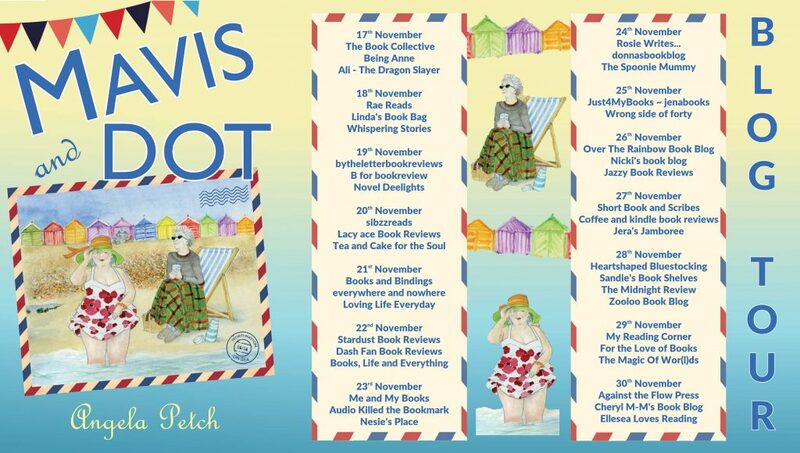 I thought I’d explain about beach huts, which feature in “Mavis and Dot”. They’re a very British seaside institution and, although nowadays they look like little more than small, painted garden sheds, they can fetch tens of thousands of pounds in certain coveted beach locations. They started really as wheeled huts in the 1730s when horses dragged the huts into the sea, whilst bathers changed inside into their costumes. In those earlier times, men and women were strictly segregated at different points along the coast. Modesty prevailed. Huts were on wheels until the 1930s and then sunbathing took over from sea bathing and stationary huts became very popular. Beach huts nowadays are used as shelters from wind, for changing, for storing deck chairs and beach paraphernalia. You can use a kettle for your cuppa and a little stove for easy cooking, but you are not allowed to sleep in there. Some local authorities let them out for an annual fee and there is usually a waiting list. Or you could be a proud (and envied) beach hut owner. Walk along the British promenades and admire some of the customisations: Here is an excerpt from an out-take of “Mavis and Dot”. Mavis and Dot borrow a friend’s beach hut and Dot suspects somebody is using it at night. 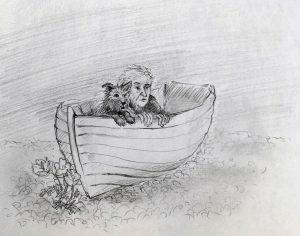 In Chapter Fourteen she carries out a night vigil, in the company of her faithful dog, Mal. “It was so pleasing having a dog. Mal didn’t argue back or ask why on earth the pair of them should be lying down in a boat at this time of night, wrapped in a blanket. She ordered him to stay next to her and he was quite happy to obey. Mal was like a hot water bottle along her side and Dot lay there, quiet and cosy, listening to the repetitive sound of the sea sucking in and out, tugging shingle in its wake, stone scraping against stone. It was a chilly, clear night and she gazed at the star-scratched sky. Her eyes began to close and then she remembered why she had come. Abandoning the idea of her flask, she undid the top of the whisky bottle and took a warming swig of spirit before settling down again. Mal snored alongside her. She was thinking about going home when she heard voices coming from the direction of the huts. Mal stirred and growled and Dot whispered to him to shush. She sat up far enough to peep over the edge of the boat. Somebody else had a torch too and she watched as the figures of two people, one far shorter than the other, used the beam as they approached Humphrey’s Hut. The taller figure fiddled with the padlock and then both people entered, leaving the door slightly ajar. Then a match flared, lighting up what Dot realised must be the little primus stove she and Mavis used for boiling water for cups of tea. 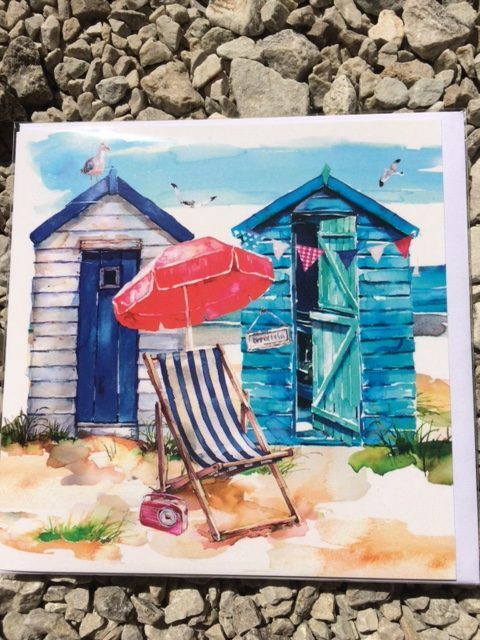 I’ve never owned a beach hut, but I love to walk along the promenade near our house in West Sussex and nose at people’s huts. People customise them and give them names and I once wrote a rap solely using the eccentric titles. At end of the book- which comes much too soon- Dot sums it up for us. I agree Dot, and I would add- thank you for showing us how important it is to find ways to love and connect with those who may need some love and encouragement. Thanks so, so much for inviting me on to your wonderful web site. Mavis and Dot are revelling in the glory this week and I’m so glad you enjoyed reading about their antics. Watch my space for further adventures – that message has come across, loud and clear from readers – that they want to read more. I’m so delighted. I wish my Mavis (aka Olga) were alive to read about what we got up to. 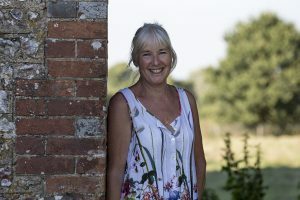 But, maybe she is reclining on a comfortable cloud armchair somewhere, reading and eating as many cakes as she wants – without the calories piling on. Who knows? Thanks, Jena. Thanks so much Angela! Yes, life is so precious and goes so fast, but friendship and love sustain us. And laughter, too! Thanks so much for sharing this amusing extract. I adore this book and the characters’ antics by the sea. It is also fun that our American friends are learning about British eccentricities. A wonderful book! Yes, here’s to Mavis and Dot! I’d like to go to Tuscany with them! Thank you Jessie! I would love to meet Mavis and Dot!! Thanks Jena! So many funny moments but also sweet and touching parts too! An all around good story! Thanks! And many thanks too from the ladies – Mavis and Dot are a little overcome – bosoms heaving and flushes at all the excitement. I can imagine! They will have plenty to talk about over tea or whisky! Lovely blog, Gena. We pass beach huts on Filey promenade every week as we make our way to the beach for a walk. In the summer families gather outside sitting in deck chairs reading the paper, or eating an ice cream. The children are usually hovering about with a bucket and spade waiting to head off to the beach. In the autumn it’s more likely to see people sitting just inside the hut, hugging a cut of hot tea or coffee. The kettle can be seen in the background along with the packet of biscuits.Now, in the winter, the doors are all closed and the huts are all locked up. But in a few months they will open up again to new families, and existing owners, all ready to enjoy the summer. A beach hut is a little home from home just waiting to be enjoyed. Lesley, thank you for the wonderful word picture of the huts as I have no experience with them. They look charming in the pictures and I didn’t realize they were still used! Although I can see that it beats lugging all the beach paraphernalia! The beach huts are a good part of The Mavis and Dot story.